With double the brightness of its predecessor, American DJ’s new X-Move LED 25R has taken the LED revolution to a new level of brilliance. 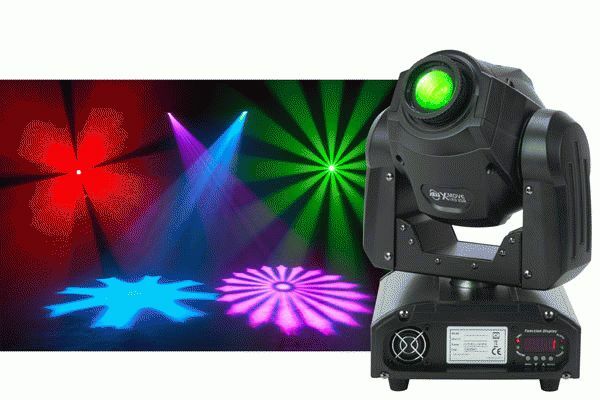 Representing the next generation of the company’s popular X-Move LED Plus, the X-Move LED 25R is a moving head fixture that uses a high-octane 25-watt CREE white LED lamp source to create a hard-edge beam that projects gobo patterns and solid colors across dance floors, walls and ceilings. In addition to increasing brightness by a factor of two, the groundbreaking X-Move LED 25R is lightweight, easy to set up and loaded with powerful features, making it ideal for clubs, DJs and mobile entertainers of virtually any size. Despite its increased brightness, the X-Move LED 25R uses a fraction of the power draw compared to traditional halogen or discharge moving heads – just 75 watts maximum – thanks to the amazing energy efficiency of the latest LED technology. The unit’s long-life LEDs are rated at 50,000 hours, so users won’t have to deal with the hassle of changing out light bulbs either. With its low heat-emitting LEDs and onboard cooling fans, the X-Move LED 25R also offers the advantage of being able to be run all night without duty cycles. The highly versatile X-Move LED 25R has 3 operating modes, making it great for entertainers of all levels of lighting experience. In addition to being compatible with a standard DMX-512 controller (9 DMX channels), it can be run in Sound Active mode to its own eye-popping built-in lighting programs. For wider area coverage in larger venues, multiple units can be linked together in Master/Slave mode. The X-Move LED 25R is also compatible with American DJ’s optional UC3 controller (sold separately). A highly portable fixture, the X-Move LED 25R weighs only 14 lbs./6.2kg. and measures 8.75"L x 8"W x 12.75" H/ 221 x 202 x 320mm. Its compact case and light weight make it an easy effect for entertainers of all sizes to set up on their own. For added convenience, the unit comes with its own hanging bracket and offers switchable voltage (120V/60Hz or 230V/50Hz) to accommodate a variety of power sources. The X-Move LED 25R has a suggested retail price of just $629.95.